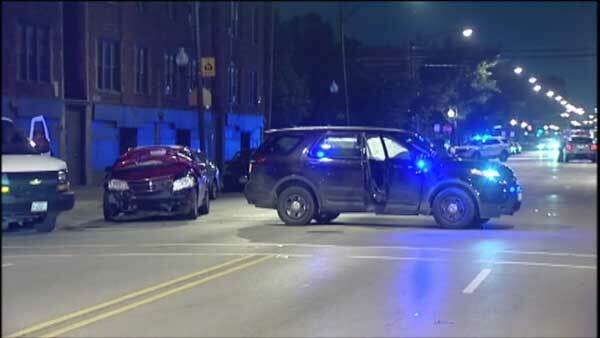 CHICAGO (WLS) -- Three police officers were injured in a crash in Chicago's Little Village neighborhood. Investigators said a driver ran a stop sign at West Cermak Road and South Millard Avenue overnight and crashed into an unmarked police vehicle. Three officers were taken to the hospital, treated and released. The driver of the other vehicle and a female passenger were taken to Mount Sinai Hospital with non-life-threatening injuries. The driver was cited with failure to yield to an emergency vehicle, police said. Eyewitnesses said the officers appeared to be following a white van that crashed into a fire hydrant. They said the driver of the white van ran off. Police said the crash did not happen during a chase and the police vehicle had its emergency equipment activated.